A family friend’s grandmother, whom I call “Ah-paw” (Cantonese for ‘grandma’), made daikon cake for my family, for Chinese New Year. My parents pan fried some of the daikon cake for dinner last night! 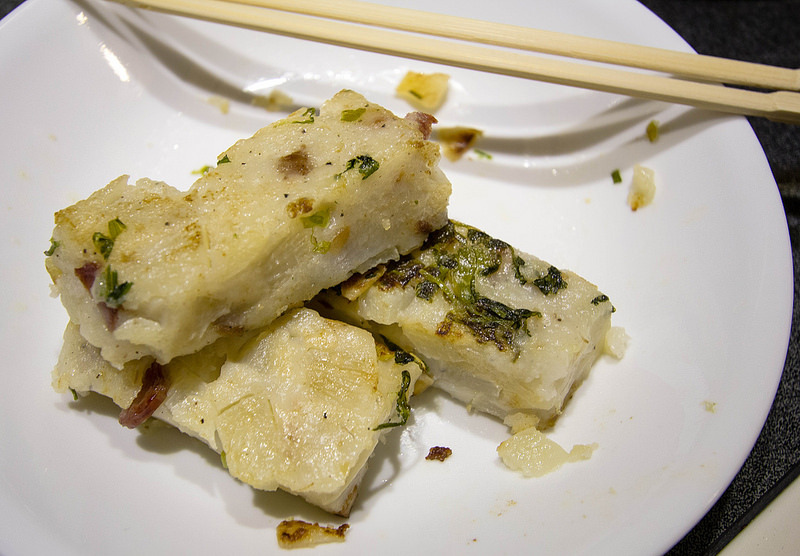 You can find daikon cake in several dim sum restaurants; they’re usually under a different name, turnip cake, but it’s essentially the same thing. Contrary to the name ‘turnip cake’, daikon is actually used, not turnip. I think it was named ‘turnip cake’ here because not many Westerners know what daikon is. A similar Cantonese dish is taro cake, where taro is used instead of daikon. Whichever ingredient is used, the taro or daikon in the cake can be in chunky pieces, thin pieces, and/or in a paste with the rice flour. However, daikon cake is more elaborate to make than taro cake if Chinese sausage, dried mushroom, and dried shrimp are added. Taro and daikon cakes are also popular to make and eat during Chinese New Year. The daikon cake I had consisted of Chinese sausage, dried shrimp, parsley, peanuts, and dried mushroom. I usually make my own sauce to go with the daikon cake, with Ajinimoto gyoza dipping sauce, sesame oil, and Sriracha or garlic chili sauce.